The Yokohama ADVAN Neova AD08 is designed with speed in mind. 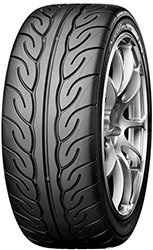 Designed for sports cars and club cars the Neova AD08 is claimed by Yokohama to be the fastes street tyre in the world. With incredible dry grip and excellent perfomance in the wet, this tyre is ready for both the track or the road. The Advan Neova AD08 hasbeen developed by some of the worlds leading race engineers and was born for the track enviornment.